Click here to download our scorecard. 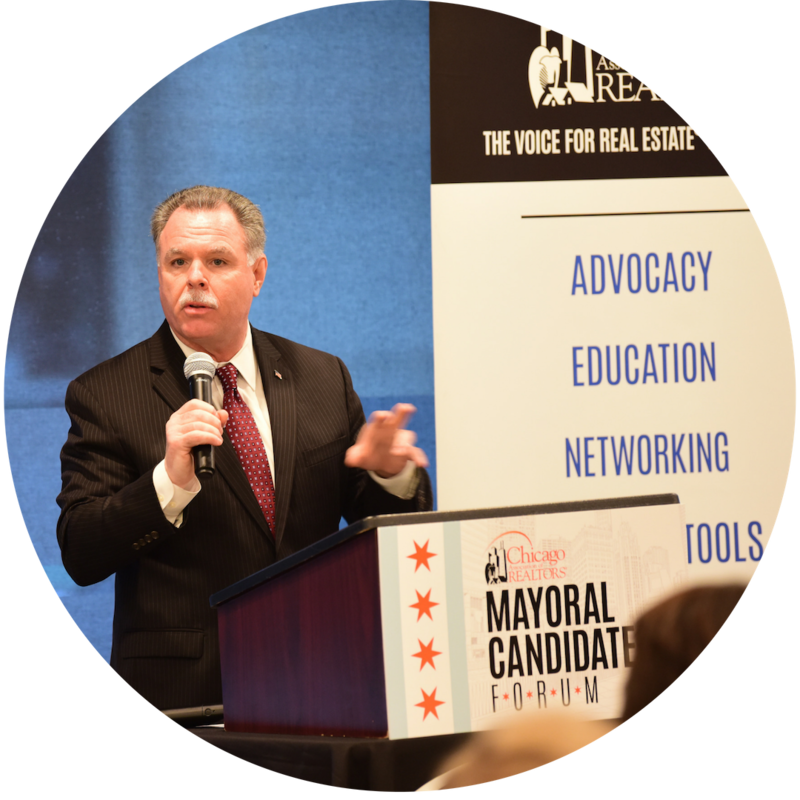 On Monday, January 28, we hosted a members-only Mayoral Candidate Forum to learn more about their stances on key real estate issues. He also touched on rent control, noting that it “does more damage,” while touting his property tax caps as a way to stabilize and lower rents throughout the city. 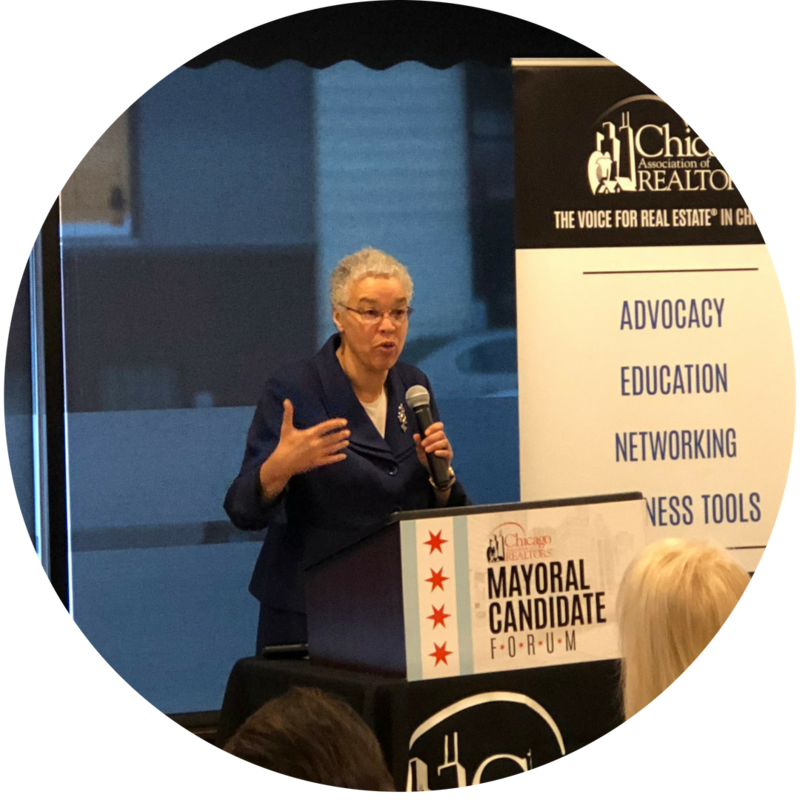 Preckwinkle, current Cook County Board President, highlighted the importance of ensuring affordable housing is ample throughout all of Chicago’s neighborhoods. A key component? Making processes more efficient. She noted that constituents and builders alike complain about the length of time it takes to get the proper permits. She ended her speech by thanking C.A.R. for our work with the Housing Authority of Cook County and their community choice program, which has helped them provide housing for people across the county. All of these are interrelated, McCarthy said. Chicago is losing population because of high taxes and gun violence. Due to decreases in population, residents see an increase in taxes because we’re losing our tax base, which leads to school closings and a decline in social services from communities that need them the most. These factors lead to gun violence, and the cycle continues. For this reason, he believes all these issues need to be addressed at the same time. He noted companies like Amazon don’t invest in Chicago, simply because it’s not safe. “Corporations and small businesses, like [REALTORS®], play an enormous role in creating affordable housing.” He is also advocating the importance of vocational and trade schools for a talented, diverse workforce. Ford, an Illinois State Representative, grew up in Cabrini, but his family eventually had to move to the Austin community due to the rising cost of living in his hometown. “[We] couldn’t move back if we wanted to,” he said. Meanwhile, he noted, there’re abandoned houses and vacant lots on the westside, which drive down value in those communities and increase costs in more developed ones. 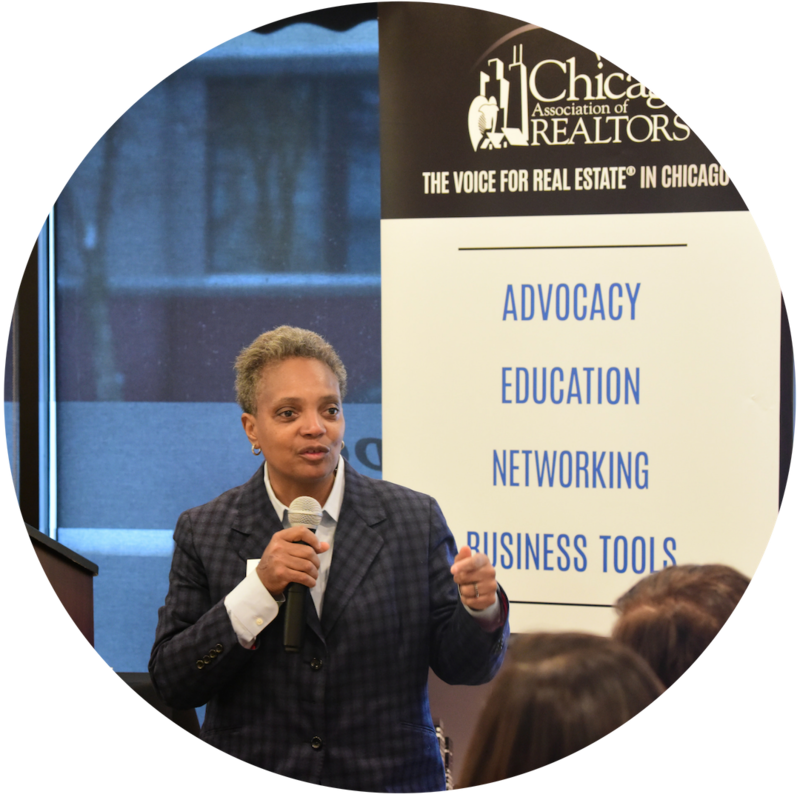 Ford, who has sold real estate for over 20 years, started his speech by identifying with REALTORS® and their ability to persevere, even in tough economic and political times. He declared the city cannot thrive without the work of REALTORS®, but it has a tendency to make selling and buying difficult by increasing taxes, fines and fees, and treating landlords poorly by instituting harsh penalties for minor building code violations. Ford also spoke on the importance of cooperation between all levels of government, and expressed his disappointment in the lack of support from the current presidential administration. 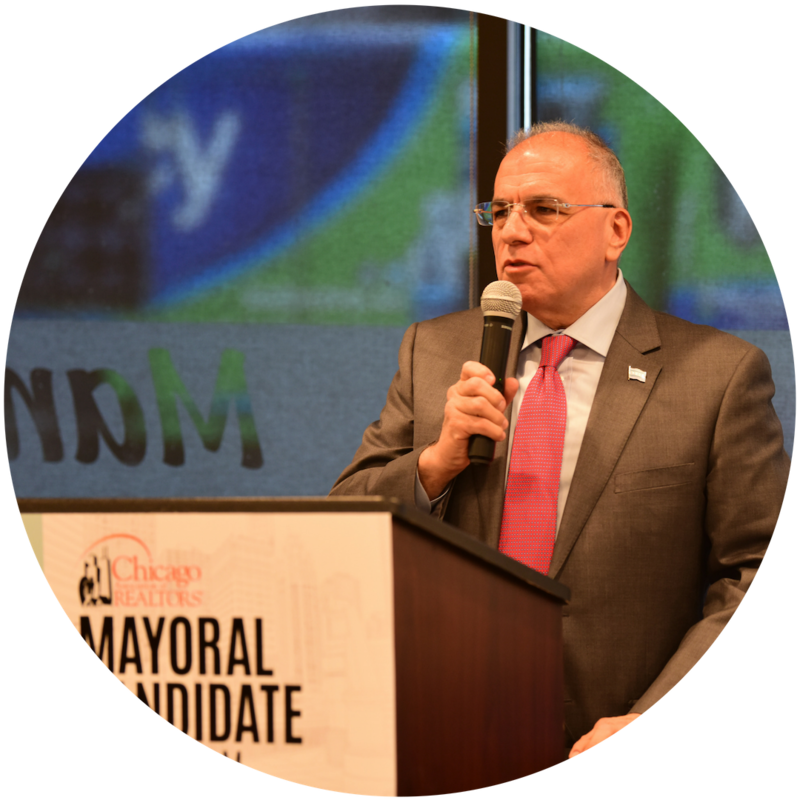 A lifelong Chicagoan from the southwest side, Chico is a real estate and construction lawyer and City Hall veteran. He noted instituting community policing and resuscitating Chicago Public Schools (CPS) as some of his most notable accomplishments. 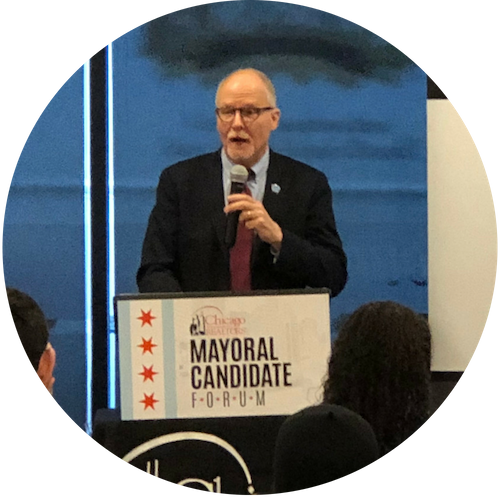 He worked with Paul Vallas and others to improve CPS’ financial and academic performance, and invested over $3 billion in buildings and infrastructure. When he went to the Chicago Parks District, his team helped buy land, build new parks and playgrounds and establish new programs. He sympathized with REALTORS® who have to work with sellers and buyers everyday in a market that has exorbitant taxes. While most of Chico’s legal work is focused on commercial real estate, he acknowledged that residential real estate is carrying much of the burden of increased taxes and fees, and this makes REALTORS®’ jobs especially difficult. 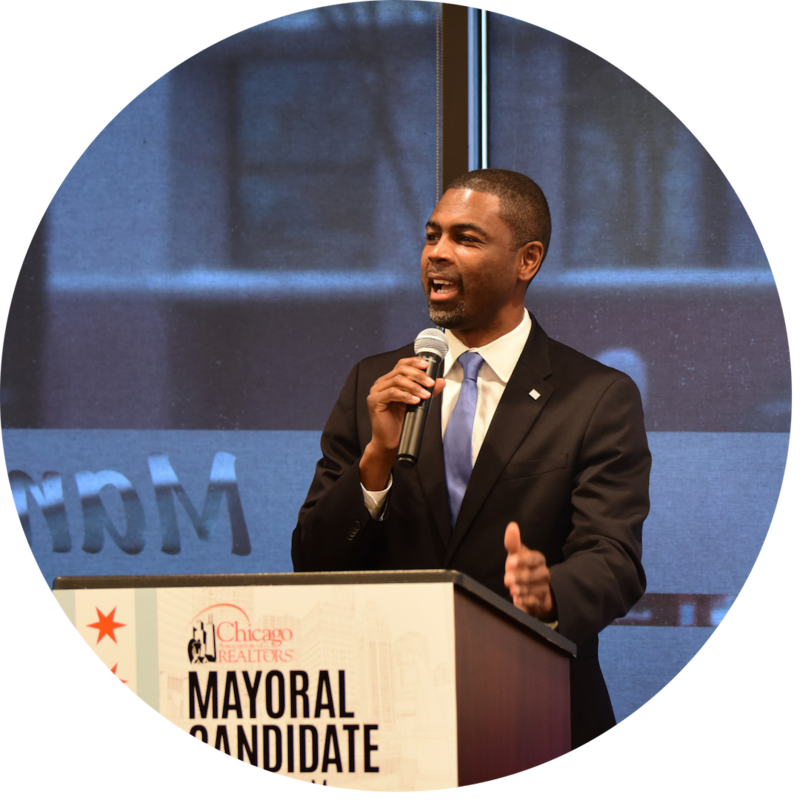 Chico said his campaign is based on the premise of making Chicago affordable, and agreed with much of C.A.R.’s stances on key real estate issues. He said no to rent control and believes in a free market. 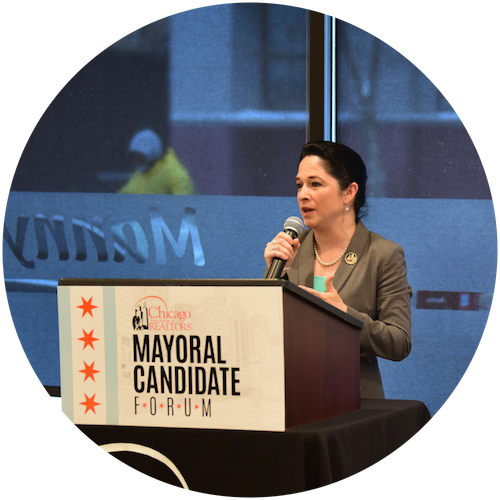 Current Comptroller Mendoza said she is running for mayor because “the future of Chicago is at stake.” She has a long history of working with REALTORS®, working closely with Illinois REALTORS® while a state legislator. She then became Chicago’s City Clerk, where she worked in tandem with C.A.R. to find a sustainable solution to parking for REALTORS® when out and about for meetings and showings. Mendoza believes that history of collaboration is why the REALTOR® community should support her at the polls. She called herself a “listener and a fixer” who finds solutions within a reasonable amount of time. As a mayor-hopeful, she looks forward to working to make a plan for more affordable housing. “Issues like rent control pop up because there are only a handful of neighborhoods….that families feel safe enough to live in,” she said. She noted her own family left Chicago when she was a child because of an increase in violence – and that many families in our city are still living with those same fears. “Rent control is not the solution,” Mendoza said confidently. She stated that each of our 77 neighborhoods have very different needs, and lifting the ban for all would not lead to a sustainable future for the city of Chicago. Lightfoot, former president of the Chicago Police Board, has been a proud homeowner in Logan Square for the past 15 years, and has seen great transformation in the area. While the transformation has been a benefit for her, she sees the impact it has on others. She says she has neighbors whose only asset is their home, and renters are struggling. Her conclusion? The city isn’t working due to a broken property tax system that “favors commercial properties, to our detriment.” This causes many people to leave. When it comes to rent control, Lightfoot doesn’t think it’s something we need to discuss yet. Instead, she’s demanding that we focus on affordable housing. “In two-thirds of the city, not a single affordable housing unit has been built.” She said her affordable housing plan calls for an elimination of the “red tape” and “bureaucracy” that has hindered needed development. To this point, Lightfoot is looking for a building code that is more flexible and inclusive. “The city has an absolute obligation, both morally and fiscally” to address the homelessness problem, she also emphasized. She spoke about her record in the police department and leading on police reform. “Public safety is so vitally important to every other issue in our city.” If people don’t feel safe – financially or physically, Lightfoot concluded, then Chicago won’t prosper. 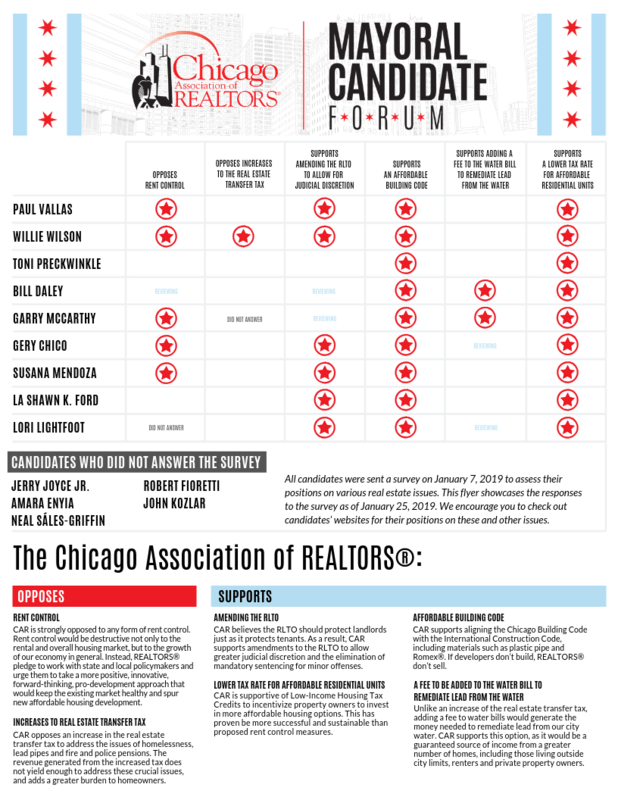 Fioretti, a former alderman in the 2nd Ward, didn’t have a chance to respond to the survey issued by C.A.R., but used his speech to express his frustration on having candidates in this race who haven’t been vocal about their support for the real estate industry until now. 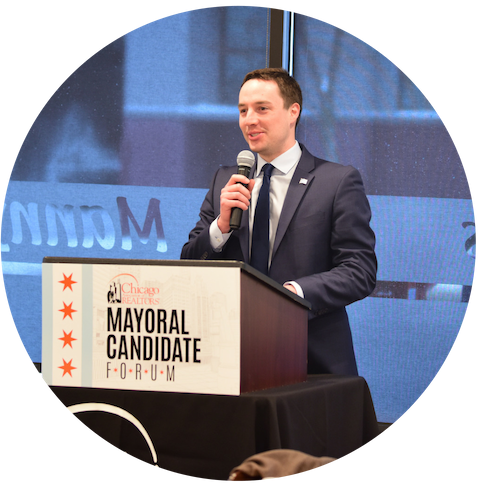 He says he has long acknowledged and fought against the corruption in Chicago politics, the increase in taxes and the other key issues that impact the local real estate market. 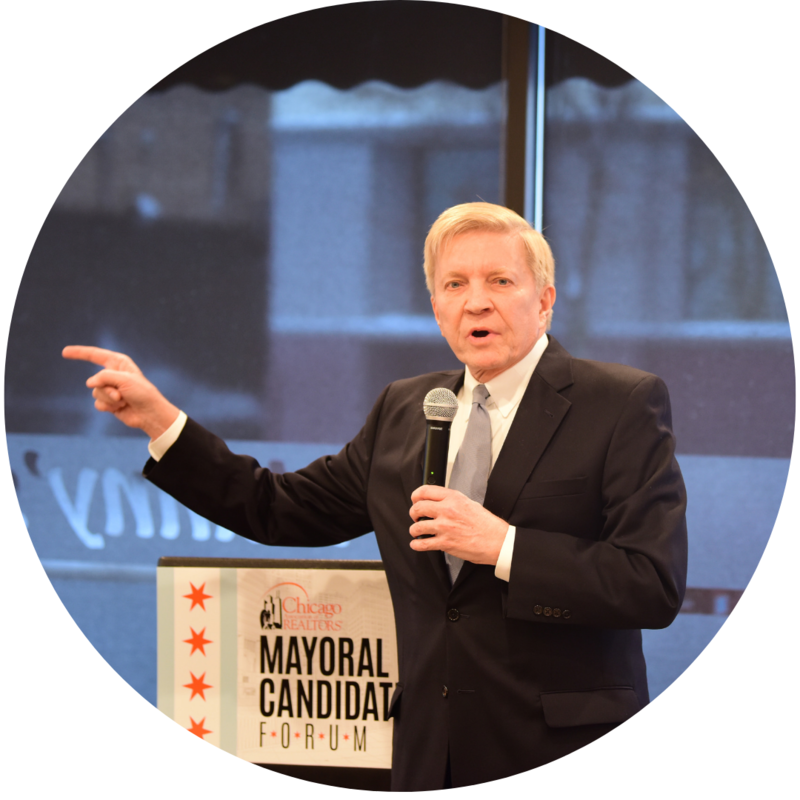 On rent control, Fioretti makes it clear that rising rent isn’t the issue; it’s rising taxes. On the real estate transfer tax, he stands by C.A.R.’s opposition to an increase. He also made a quick note that he supports amending the RLTO to allow for judicial discretion. If elected mayor, he wants to address crime first. He has a plan to mandate that for every neighborhood’s police department, at least 60 percent of officers must live in the communities they are policing. This, he believes, would help alleviate the tension between communities and police. Next, Kozlar addressed city finances. For starters, in 2020, he wants new City employees to start a 401K plan, rather than a pension, to “stop the bleeding.” He advocates for hiring an outside auditing firm to assess the city’s spending – an idea that has been floated around but never implemented. Similar to naming rights for stadiums, he also sees a $200 million revenue stream in leasing naming rights to our bridges.